Most of you who have followed me for awhile know I try to use natural products as much as humanly possible. I’m also having a problem with my hair being unruly, frizzy and down right dry. It never looks healthy as I age. Over the last few years I have tried many shampoo/conditioner combos, coconut oil, argan oil, hair masks, washing every other day, etc. Nothing worked. Looking at your nutrition is important to heal from the inside out, so always investigate that as well. We have recently gone Paleo as a way to do an elimination diet and figure out what my body reacts to. Hopefully with that I find what my body needs so I can heal my hair from the inside out. 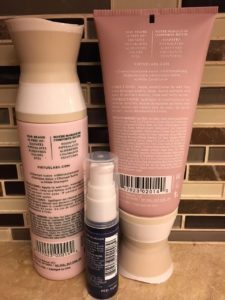 Virtue Labs has sent me their Smooth Shampoo/conditioner. At first they sent me a sample size. From what I saw from that I was intrigued. In just a few uses, my hair was soft and NO flyaways! I asked them to send me full size shampoo and conditioner so I could do a longer term review. Honestly, I am amazed. Virtue Labs are free of Parabens, Sulfates, Phthalates, Colors & Dye. My hair lays smooth with no flyaways, its soft and not brittle, and honestly I am actually loving my hair! I always struggle with chopping it off because it drives me insane with how its been looking. After I use this for a few more weeks and research the ingredients more, I will post an update at the bottom of the article. 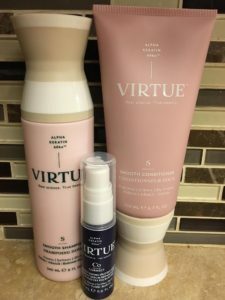 I am still on the search for a natural product, but thought I would try Virtue Labs for my readers. From reading on their site the shampoo refines and de-frizzes strand by strand, sealing in moisture and shine. It is Color-safe and ideal for medium-to-thick, harder to manage hair. You can get the shampoo on amazon, but the conditioner is only available on Virtue Labs site. Alpha Keratin 60ku™ is the key to Virtue Labs products. It is a is a pure, whole, human protein. Alpha Keratin is identical to the keratin in your hair, skin, and nails so it heals and repairs. The ingredients contain a blend of flower, fruit, herbs, soothing lavender, sweet pear, and fresh mint essential oils. According to Virtue Labs, Six years ago, a group of bio-scientists had found a new way to collect Keratin in its pure form. It is the protein that makes up 90% of our hair, skin and nails. They had discovered Alpha Keratin 60ku™. The creator met Lt. Col. Dr. Luke Burnett. At his lab, his team works to advance regenerative medicine and help those who have sustained traumatic injuries on the battlefield. (AMAZING for our soldiers). Six years ago, they developed a way of harvesting keratin in its purest, most powerful form – directly from human hair. For the first time, they were able to keep the protein whole, and test results showed profound healing effects. The creator of Virtue labs was inspired by the findings, so she created Virtue. What I love about this shampoo is you only need a quarter-sized amount of shampoo! Rub it into a lather between palms and apply to wet hair and massage into scalp. In researching Alpha Keratin 60ku, I ran across an article on follicle thought.com that talks about the Winston/Salem clinic by Col. Dr. Luke Brunett. Scroll down about 1/4 of the page to find the article. Alpha Keratin 60ku™ is supposed to be recognized by our bodies recognize it as our own, and that makes it really powerful. It’s pulled to where its needed, strand by strand, smoothing, resurfacing and filling in cracks of damage. 67% Reduction in frizz – Hair in vivo under real world conditions before and after 4 applications. Hair is dramatically smoother, more composed, and 67% less frizzy. I have to say I have noticed this fully. My hair was dry and out of control and always frizzed out like that! Now, it looks much like the bottom picture with amazing shine. 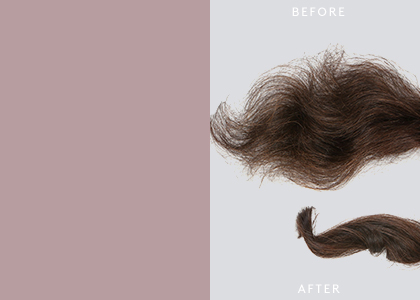 138% Increase in color vibrancy – A single hair before and after 5 applications. 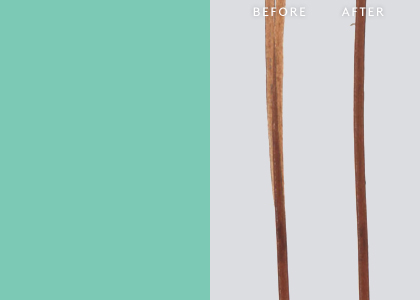 As the hair is repaired, color is restored and vibrance increases by up to 138%. I have dark hair, so I’m not sure how to measure this one. I’m sure its accurate because it heals the hair and heals the damage. I just recently cut off 4-6″ of hair because I couldn’t stand it anymore. 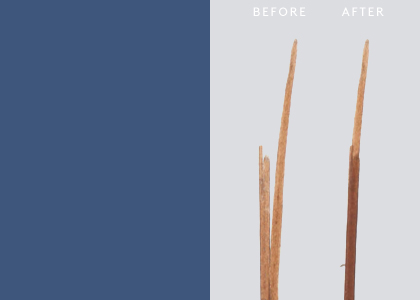 95% Split End Reparation – A single split hair before and after 5 applications. The hair is made whole again, achieving a 95% reparation. 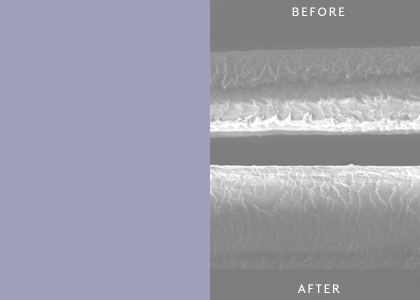 22% increase in the thickness – A single strand, magnified 860x, after 1 application. Moisture levels rise and each hair grows up to 22% thicker. I have noticed a huge difference in the moisture levels and thickness in my hair, which could also be why it is not frizzing and having flyaways.